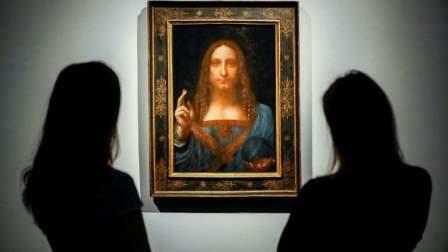 'Salvator Mundi,' a painting of Christ by Leonardo Da Vinci that recently sold for a record $450 million(Dh1,652,850,000), is heading to the Louvre Abu Dhabi in a coup for the bold new museum, it announced on Wednesday. The move became possible after a Saudi prince reportedly bought the painting last month. The Louvre Abu Dhabi, the first museum to bear the Louvre name outside France, has been billed as "the first universal museum in the Arab world," in a sign of the emirate's global ambitions. "Da Vinci's Salvator Mundi is coming to #LouvreAbuDhabi," the museum said on Twitter in Arabic, English and French. The post displayed an image of the 500-year-old work but did not identify its owner. Auction house Christie's has also steadfastly declined to identify the buyer, whose purchase in New York for $450.3 million stunned the art world. "Congratulations," Christie's said in a tweeted reply to the Louvre Abu Dhabi. The New York Times on Wednesday, citing documents it reviewed, identified the buyer as Saudi Arabia's Prince Bader bin Abdullah bin Mohammed bin Farhan Al Saud. Prince Bader has no history as a major art collector but is a friend and associate of Saudi Arabia's Crown Prince Mohammed bin Salman, the Times said. Prince Mohammed, in turn, has been called an admirer of His Highness Sheikh Mohamed bin Zayed Al Nahyan, Crown Prince of Abu Dhabi and Deputy Supreme Commander of the UAE Armed Forces. The newspaper said that the work will be lent or resold to museums, largely in the Middle East and Asia. Prince Bader is listed as a director of Houston-based Energy Holdings International, Inc. The firm's website describes him as "one of Saudi Arabia's youngest" entrepreneurs, present in sectors including real estate, telecommunications and recycling. The sale more than doubled the previous record of $179.4 million paid for Pablo Picasso's "The Women of Algiers (Version O)" in 2015, also in New York. The Louvre Abu Dhabi opened on November 8 in the presence of French President Emmanuel Macron, who described the new museum as a "bridge between civilizations." Featuring a vast silver-toned dome, the Louvre Abu Dhabi was designed by French architect Jean Nouvel, drawing inspiration from Arab design and evoking both an open desert and the sea. The museum opened with about 600 pieces including items from early Mesopotamia. Under a 30-year agreement, France provides expertise, lends works of art and organises exhibitions in return for one billion euros ($1.16 billion). The first works on loan from the Louvre in Paris include another painting by Da Vinci - "La Belle Ferronniere," one of his portraits of women. "Salvator Mundi," which means "Savior of the World," went on public display in 2011 in a dramatic unveiling at The National Gallery in London, where the work was declared to be the first newly discovered Da Vinci painting in a century. It is one of fewer than 20 paintings generally accepted as being from the Renaissance master's own hand, according to Christie's. Its latest sale was initiated by Russian tycoon Dmitry Rybolovlev, the boss of football club AS Monaco. He had bought the painting in 2013 for $127.5 million although he later accused a Swiss art dealer of overcharging him.